This summer, have the time of your life getting out and giving back. Organizations across our Jewish community have come together for Summer of Service, where you’ll find numerous ways to get involved – whether it be at the 20th annual Yom Sport, or canoeing (and cleaning!) down the Charles. Tonight we add to a month of incredible ideas with PresenTense’s Social Innovation Showcase, where the spotlight’s on cutting-edge ventures that bring positive change. But what is PresenTense, and why is it so awesome? Fear not, we have all your questions answered. Before you question our basic math skills, check this out: as the CJP 2015 Annual Campaign comes to a close, our Co-chairs Aron Ain and Dena Boronkay Rashes have offered to contribute an additional $100,000 if 500 caring people give a donation before June 30. With numbers like that, what are you waiting for? June is National LGBTQ Pride Month, and we’re joining up with Keshet to proudly celebrate our identities as LGBTQ Jews and allies. Discover Pride Shabbat services, community conversations, Pride parades (and awesome parade signs to hold) and more! Celebrate – and sample – the incredible work of CJP’s 2015 PresenTense Fellows. The Social Innovation Showcase highlights game-changing ventures, including everything from new transportation services for seniors to kosher food experiences. But hurry – the Showcase is tonight! As we mentioned earlier…on June 14, get ready to kick off Summer of Service and hit the field with an amazing group of athletes! At Yom Sport, you’ll break a sweat with adults of all abilities, then meet up with other volunteers for the after party. On June 22, join renowned experts and other young adults for israel360’s fascinating discussion on religious freedom and tolerance in Israel, and explore how Judaism—or various interpretations of it—is present in Israeli laws, society and rituals. CJP’s Ben-Gurion Society—a group of engaged young leaders who contribute $1,000 or more to CJP—celebrates an amazing year on June 23. Interested in learning more about this incredible group, and what they’ll be up to in the year ahead? Contact Julia at juliap@cjp.org for more info! Explore the spiritual and intellectual richness of Judaism – in the company of fabulous folks, no less. With Kevah, you’ll join friends, settle in with a dynamic educator and choose what’s meaningful to you from a full menu of fascinating topics. Contact Stephanie at stephaniew@cjp.org to start a group! That’s right, #ThrowbackThursday is (almost) here! Save the date for July 23, where the glory days of summer will reign supreme at Blazing Paddles. 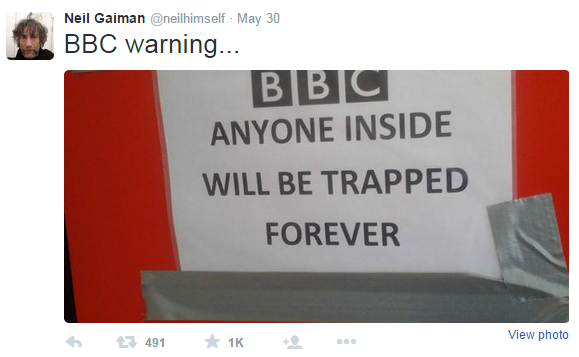 Jewish Author Neil Gaiman (of American Gods, Coraline, Stardust, The Sandman and Good Omens fame) shares behind-the-scenes details from the BBC – and a healthy dose of classic British absurdity. At Keeping it Real, Jewish Journal blogger Ilana Angel keeps it as real as she can – or at least as real as one can get when discussing The Real Housewives franchise. With taglines like “Typos are generously sponsored by Jose Cuervo” abounding, our fearless blogger recaps the drama from Melbourne to Manhattan. Does life get much better than this? 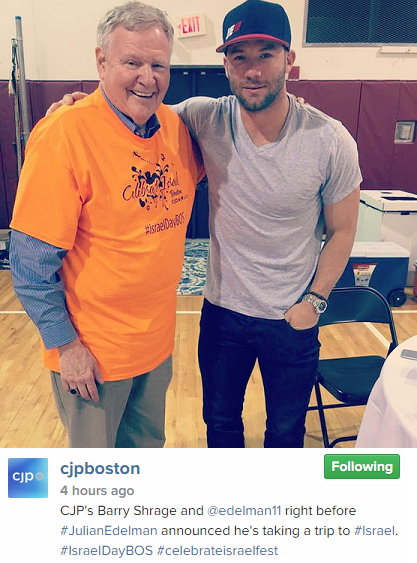 CJP President Barry Shrage strikes a pose with none other than Julian Edelman at Celebrate Israel: Boston – right before our favorite Patriot announced he’s taking a trip to Israel! Easy there, Jon Snow. Just join us for this month’s candlelighting times, and we can forget all that “beyond the wall” nonsense. June 12 | 8:03 p.m.
June 19 | 8:06 p.m.
June 26 | 8:07 p.m.
July 3 | 8:07 p.m.